This zesty orange syrup is bursting with fruity flavour. The taste of refreshing citrus will brighten your dull drink days. 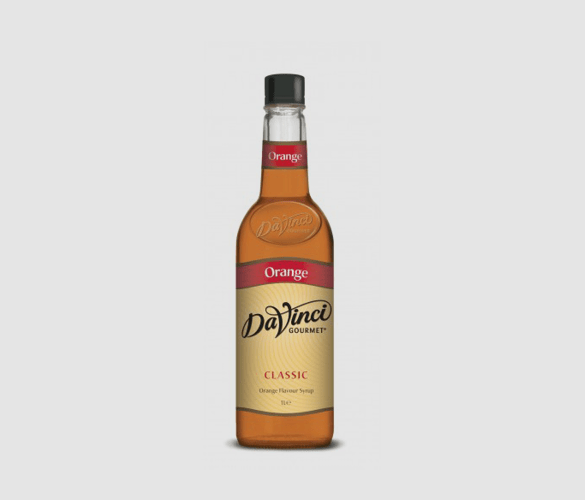 This bottle of orange syrup is a delightful treat that adds a refreshing twist to any recipe. Made with the highest quality ingredients, this product will give you a true orange taste which is not too sweet. Add to your cocktails for a tropical twist that will make you feel like you’re relaxing on a sunny cruise. This fiery coloured syrup is like Summer in a bottle and will boost your mood on the gloomiest of days. It is such a popular flavour and can be used in so many different ways. The versatility of this product is one of its main benefits, apart from the delicious taste. Use in a variety of drinks, hot or cold, for a refreshing hint of citrus. Coffee – Hot or iced, this is a great combination. Perfect for anyone that doesn’t like anything too sweet and is looking for something more refreshing. Tea – Again, hot or iced works great! Try different flavour combinations, such as fruit, herbal, black and other teas. Ice Cream – Try this drizzled over ice cream and you will not regret it. It adds so much excitement to a bowl of ice cream and is such an easy way to add something special. Desserts – This orange syrup works in so many dessert recipes, the possibilities are endless. A few ideas where you can add a splash of this syrup are brownies, cake, cookies, milkshakes and more. Dressing – This may sound odd at first, but try this syrup in a salad dressing instead of honey to sweeten things up. It adds a delicious zesty flavour. This recipe for a vegan orange syrup cake is moist and absolutely delicious. It is a great healthy option when wanting to indulge, but still tastes rich and delightful. The recipe is from Unconventional Baker and we have converted the American measurements for you. Preheat oven to 180°C. Oil a round cake pan. Mix the flax egg ingredients in a small bowl and leave to gel. Mix together all the dry cake ingredients first in a large bowl and then add the wet ingredients and the flax egg. Pour mixture into the cake tin and bake for around 40 minutes. You will know the cake is baked all the way through when you stick a metal skewer in the middle and it comes out clean. For the sauce, mix together the ingredients in a saucepan and leave on a low heat for around 25-30 minutes. Leave the cake to cool and then drizzle the sauce all over, serve and enjoy!